- keep your pages private, link to them from your posts or from a custom menu or share them just with friends. What is the difference between the three options? - a widget containing the list of the static pages which shows up on your blog as a horizontal or vertical menu. - the static page itself which looks almost like a post page. a horizontal menu above the post area or in the crosscol section (under header) with the styling set in the CSS of your own template . Though you can customize the look and feel of the widget (in new templates), you are not permitted to include other links in this menu, just those of static pages. Now you can add links to external websites or pages to your pagelist (menu), using the new Blogger interface. Don't show your pages but link to them from a post, form a menu or just share the page url with your friends. 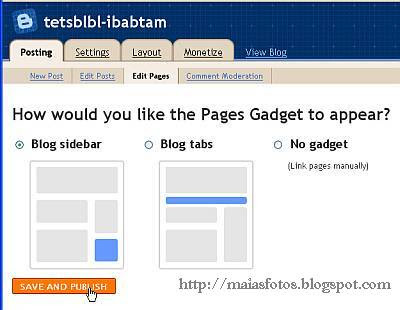 To choose the way you want to display your pages you have to switch to the new interface. Step 1. Click the "Try the updated Blogger interface" link at the top of the editor page. Click again the dropdown near Show pages as and you will see the three options (picture at the right). We are done here. No we are not, you say?! You are right, let's see why? As you probably noticed, no matter which option you choose from the above, all your pages in your blog will be handled the same way: all displayed or all hidden. This is not exactly what we want, is it? If you have many pages there is no way to squeeze all their links in a horizontal menu. Besides, you may want to hide a few of them. If so, see how to reorder your pages. You should also know the differences between a post page and a static page. Static pages have some different properties you should be aware of, before you create one. Of course, you can publish and experiment on your own; you can delete these pages at any time. Difference between static pages and post pages. why my blog doesn't have that option? It's been a while since I wrote this tutorial and Blogger is changing all the time. You still can access this feature from the new interface. I've just updated this tutorial. Thanks for your useful remark! Please don't leave link in your comment. Thank you. Search for photos, macro photos or paintings. Do you want to create a separate archive page for your blog too? If yes, click the link above to go to the tutorial. Have a look at my portfolio at Shutterstock. • Difference between static pages and post pages. • Christmas icons-Decorate your blog! © Color Magic - Photography: Images or any text may not be copied and/or reproduced without the owner's written permission.